Pomskies can vary in size greatly. First generation Pomskies are typically 15-25 pounds. You can find smaller or larger Pomskies from Multi-generation breedings. We have Pomskies that range from 7-40 pounds as adults. What is F1, F1b, F2 ect? This stands for what generation the puppy is. F1b- One parent is a F1 Pomsky. The other parent is a purebred Siberian Husky or Purebred Pomeranian. F2- Both parents are F1 Pomskies. F2b- One parent is and F2 Pomsky. The other Parent is a purebred Siberian Husky or Pomeranian. Multi-generation- A Pomsky with multiple generations of Siberian Huskies, Pomeranian, and/or American Eskimo breeding. Are Pomskies good family dogs? In general, yes! Pomskies are very affectionate loving dogs. However, as with all breeds they need to be treated fairly and trained to be good family members. We strongly encourage your family to attending professional training classes to insure a good start with your new puppy. 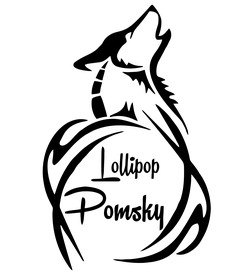 Deposit list- Please go to the adoption application tab, copy it, paste it and fill in the answers in your email to lollipoppomskies@gmail.com. Once we have approved the application we will give you a set price. Then you can place a $100 deposit by paypal, venmo, or cashiers check. When you are on our deposit list you will get to pick your puppy in the order that deposits were placed. We guarantee you will get a chance to pick a puppy within 8 months. If there isn't a puppy available for you within 8 months I will send your money back or you can remain on my list. How much does one of our Pomsky cost? Our Pomsky puppies are typically priced between $1500 and $3000. Once we receive your adoption application we will give you a set price. Occasionally we do know of older Pomskies needing new homes and can get you in touch with their owners.